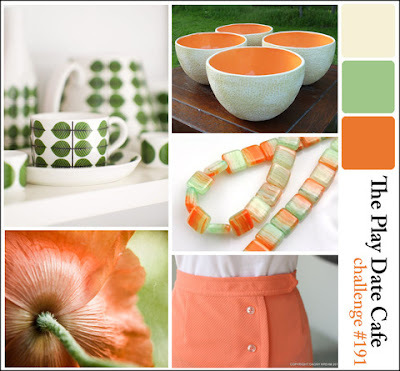 I decided to play in The Play Date Cafe as I absolutely love these colors...melon and cantaloupe! I used Stampin' Up's Crisp Cantaloupe and Pistachio Pudding cardstock and ink. The card base is PTI's vintage cream cardstock. I did a tri-fold card. The colors do not necessarily go with SCC2's colors but I did follow Jennifer's fun card! I stamped the biggest flower in the Crisp Cantaloupe and added some darker shading with Stampin' Up's blender pen using Calypso Coral ink. This stamp is from Cutting Garden at PTI. I used the matching dies to cut out the flowers and leaves. The sentiment is from PTI's Signature Greetings II. The enamel dots are from MME. I added a little glitter in the center with the Sakura glitter pen. The inside sentiment is from Stylish Sentiments Birthday from PTI as well. All sentiments were stamped with Stampin' Up's Baked Brown Sugar. I like how these colors look so good together. I am sending this card to a dear lady who will be 89 this month! She was always like a second mom to me. Hope you enjoyed today's post! Enjoy the rest of your weekend!